FURever Home Friday: Baby Girl | This blog is affiliated with the Cedar Bend Humane Society in Waterloo, Iowa to share pet-friendly resources, adoption stories, and CBHS events. Click HERE to watch Baby Girl’s FURever Home Friday feature. At seven years old, Baby girl is considered a senior dog – but she’s still got a lot of pep in her step! 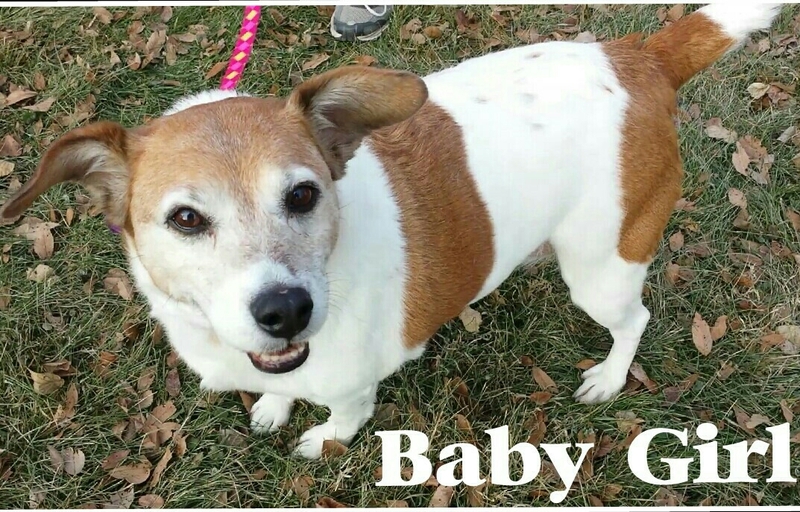 Baby Girl is a jack russell terrier and possibly beagle mix. Her white and brown spotted fur is very soft and her tail rarely stops wagging. She’s a happy and loving dog who will make a great family companion. Baby Girl was surrendered to the Cedar Bend Humane Society at the end of October after her owners decided they didn’t have the time to give her the love and attention she deserves. She does very well on a leash, and she wants someone who is able to take her on lots of walks to help get her back to a healthier weight. In typical beagle fashion, she enjoys following scents and lets her nose guide her where she wants to go. She’s spayed, potty trained, knows how to sit, and does well with other animals. Don’t be surprised if she’d rather cuddle with you than play with toys or chew on rawhides. Will you give Baby Girl the cuddles and FURever home she needs? Visit the Cedar Bend Humane Society at 1166 W. Airline Highway to meet Baby Girl and to fill out an adoption application. We’re open all weekend from 10 to 5! This entry was posted in FURever Home Friday by cedarbendhumanesociety. Bookmark the permalink. Yes, she was adopted in December 2014. This is such a sweet girl! I started volunteering at the shelter and she was also there when I adopted our new dog Max. I hope she soon finds her forever home!